MOHAN USA: Promoting Ethical Organ Donation. MOHAN USA, Inc. is a 501(c) (3) registered nonprofit organization that was formed to increase awareness about organ shortage and promote transparency and ethical organ transplantation in India and the rest of the world. Mohan USA was founded by a group in the USA that includes eminent doctors and individuals who are passionate about the cause of organ donation. In India, over 500,000 people die each year because of non-availability of organs. Nearly 150,000 people await a kidney transplant but only 5,000 get one. The rate of deceased organ donation in India is significantly lower than the USA and Europe. It stands at just 0.47 per million population, which is about 50 times less than in the USA which has a rate of 26 per million population. If India were to increase its rate of organ donation even slightly, there would be enough organs for many on the waiting list and thousands of lives could be saved. MOHAN USA aims to accomplish this by partnering and collaborating with established organizations and reputed non-government organizations (NGOs) in India and worldwide that are already addressing this problem. We plan to fund programs with our partner NGOs that raise awareness about organ donation among the public, train grief counselors to provide compassionate support to the families of potential donors, and train transplant coordinators to facilitate organ donations between donor families, hospitals and patients. We also plan to support NGO’s that work with state and local governments to pass legislation to promote organ donation and ensure that the organ donation process is ethical and transparent. 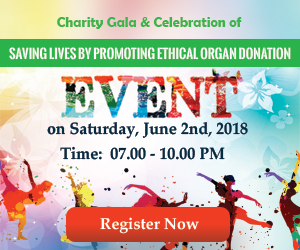 One such NGO that we are partnering with is MOHAN Foundation (www.mohanfoundation.org), that has been a pioneer in promoting ethical organ donation in India since 1997. They have facilitated over 6000 successful organ transplantations and their efforts have been credited with tripling the rate of deceased organ donations in Tamil Nadu, making it the highest in the nation. They have been invited to share their expertise with other countries, including an agreement with the National Health Service (NHS) in the UK, and they recently won the prestigious British Medical Journal South Asia Award for Healthcare Advocacy. Our mission to support and promote ethical organ donation will not only give the thousands of patients a second chance at life, but also curb the illegal and unethical trafficking of organs. We believe that no one should die awaiting an organ, or have to buy one, or be reduced to poverty in their effort to survive the curse of terminal organ failure.